The Japanese government’s recent proposal of the “Designated Secrets Bill”, under which journalists could face arrest and prosecution for divulging state secrets, has been cause for much concern among many of my colleagues. It is at the very heart of investigative journalism in open societies to uncover secrets and to inform the people about the activities of government. Such journalism is not a crime, but rather a crucial part of the checks and balances that go hand in hand with democracy. The "Designated Secrets Bill" specifically warns journalists that they must not engage in "inappropriate methods" in conducting investigations of government policy. This appears to be a direct threat aimed at the media profession and is unacceptably open to wide interpretations in individual cases. Such vague language could be, in effect, a license for government officials to prosecute journalists almost as they please. 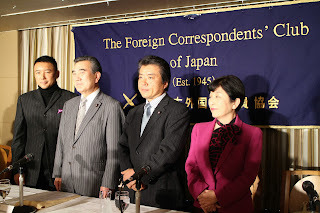 Yesterday, I attended a press conference at the FCCJ during which several prominent politicians voiced their opposition to the proposed “Designated Secrets Bill” (press release HERE). When Social Democratic Party member Mizuho Fukushima asked lawmakers in the ruling party to explain the definition of “secret”, the reply she received alarmed her. “What is considered secret,” she was told, “is secret”. Mr Sohei Nihi, of the Japanese Communist Party, expressed his concern that people could be arrested and prosecuted for revealing something they did not realize was considered a state secret. He suggested that with such vague wording in the bill regarding what is considered a secret, the government could use it to control information it deemed to be unflattering. When expressing his concern about the bill, Mr. Ryo Shuhama of the People’s Life Party suggested that if the government yields too much discretionary power then there is the danger that human rights may be violated. However, it was perhaps the youngest and newest politician in attendance, Independent lawmaker Taro Yamamoto, whose words were most anticipated. Yamamoto wondered why a bill such as this is even necessary when information that the public has a right to know is already being tightly controlled. As an example, he explained that he recently discovered that equivalent of nearly 2.5 million USD of public money that had been earmarked for reconstruction efforts after the March 11, 2011, disaster was used for “exploratory research” into how to promote the sale of Japan’s nuclear technology to Vietnam. In the public’s interest, Yamamoto requested the relevant papers which he brought to the press conference. The files were redacted to the point that they were nearly entirely black (PHOTO below).